Only the Brave and Thor:Ragnarok are the two top best moves in 2017 and the Blu-ray and DVD versions are about to be released soon in Feb and Mar. I’d surely like to get myself a copy of the DVD version or Blu-ray version when they are released and get the Blu-ray DVD ripped or backup to hard drive in MP4 or AVI to future playback. To do that, you will need the help of a best DVD ripper to decrypt the Bluray DVD copy protection. Leawo Blu-ray Ripper and Leawo DVD Ripper from Leawosoft are the among the best DVD and Blu-ray rippers that are continuously upgraded to be able to remove DVD Region code and CSS protection and Blu-ray AACS, BD+ and MKB protection. If you want to either the Bluray or DVD version of Only the Brave or Thor: Ragnarok in the near future to any video format including AVI, MP4, MKV etc or only devices like iPhone/iPad/Apple TV or Android devices like Galaxy S9, VR headsets, you are coming to the right place. If you want to both the Bluray version of Thor: Ragnarok as well as Only the Brave, go for Leawo Bluray Ripper, if DVD version, Leawo DVD Ripper. The difference between them are Leawo Blu-ray Ripper works for Bluray and DVDs sources in disc, ISO file, Bluray/DVD folder, dvdmedia file but Leawo DVD Ripper only works for DVD sources. But as the two are parts of Leawo’ all in one app Leawo Prof Media, the output are all the same like MP4, AVI, MKV, WMV, MOV but name but a few. Also, mobile devices from Apple (iPhone X, 8, 8 Plus included), Google, Samsung are also supported. With Leawo Bluray or DVD Ripper, you are able to rip and convert Bluray DVDs like Only the Brave and Thor Ragnarok with super-easy steps. I will take Leawo DVD Ripper on my Windows 10 as an example to show you the process of ripping Bluray DVDs to MP4 H264. Please note this guide will also apply to the Bluray Ripper and the macOS version! Follow the below two buttons to download Leawo Prof. Media, install and launch it. Also, insert the Bluray DVD you want to backup. 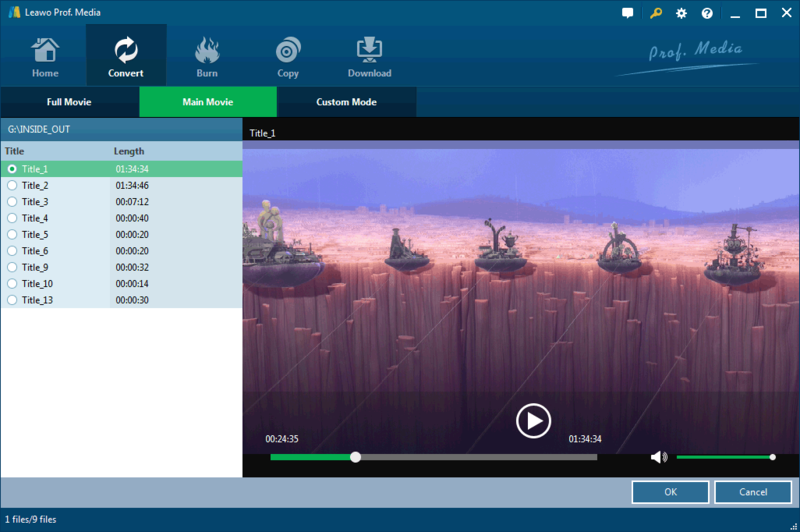 Click the Bluray Ripper or DVD Ripper in the main interface or the Convert tab on top. Load the DVD or Bluray disc button from “Add Blu-ray/DVD” and then “Add from CD-ROM” to load any protected and home-made Bluray DVD like Only the Brave and Thor Ragnarok you want to rip. It will take only a few second for the program to analyze the Bluray DVD and select the right title for you. And you are presented to choose the Full, Main or Custom mode along with a preview window. For Only the Brave and Thor Ragarok Bluray DVD Ripping, I’d like to recommend you guys to choose Main Movie mode. If your ripped video is out of order, it may select a wrong title for you. Check below to see how to check correct DVD title for ripping and change the title info in the above window. After the Bluray DVD is loaded, you will be brought back with basic title info like file size, resolution etc and the MP4 as the default output profile. If this is NOT the one you need, say, you want to rip Bluray DVD Thor Ragnarok to MKV, click MP4 Video-Change or Edit to make you own decision. If there is other steps needed if you want to trim to set the destination folder yourself. Just hit Convert and leave the program ripping Bluray DVDs to MP4 or whatever format you prefer.